EPDs in digital form on IBU.data | Institut Bauen und Umwelt e.V. Institut Bauen und Umwelt e.V. makes the LCA-based data from the Environmental Product Declarations (EPDs) for building products available in digital form as XML files on the basis of the ILCD format for downloading from IBU.data. IBU thereby permits and promotes the use of EPD data for calculating component and building Life Cycle Assessments (LCAs) in software tools as well as the subsequent assessment of environmental impacts at building level from a sustainability perspective. The use of IBU.data is free of charge. With the IBU.data platform the Institut Bauen und Umwelt e.V. makes available a standardised digital database for the life-cycle assessment of structures whereby building materials and building components are described with respect to their ecological impact. IBU.data provides company- or association-specific datasets from Environmental Product Declarations (EPDs). 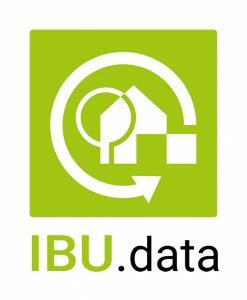 The datasets published in IBU.data can be viewed by the end user and may be downloaded for the purpose of calculating building life-cycle assessments after registering free of charge. Any further commercial use of the data, in particular circulating it to third parties, requires entering into a licensing agreement. In principle it is possible to just view datasets published on IBU.data in html mode without registration. If data is to be downloaded from IBU.data, registration on IBU.data is absolutely essential for downloading the data. Only registered users may download datasets for calculating building life-style assessments from IBU.data. Registration is carried out via the IBU.data user registration screen. During registration the user undertakes to the IBU to give truthful, exact, current and complete details on his identity, professional activity and contact details. The IBU must be notified of any changes to the user data and the user account must be updated accordingly. For this purpose the user may make changes to his own data at any time. The user is informed that IBU may carry out a check of the details on the form. Registered users undertake to create one account only. As part of the registration process, the user will be sent an activation link for the account to the email address given by him on registration. Access to the download area of the XML files will only be possible when the user has completed the whole activation process stated in the email. The email address given and the password chosen by the user on registration enable access to the dataset download area. The EPDs are products of the IBU. Extracts from the EPDs are published in the IBU.data online database. The information obtained is based on information from the manufacturers. In spite of conscientious processing of the information available the IBU cannot assume any liability for the details being up to date and accurate nor for the evaluation of the products. The user of the EPDs, the processor/purchaser of the products or the consultant/planner recommending these products is not absolved from the responsibility to test the intended application for himself. The IBU enables the user to access its IBU.data database via the internet. The IBU reserves the right to make modifications or additions to the information, data and layouts provided without notice. The user has no entitlement to the availability of the domain or the corresponding server. Therefore any liability of the IBU in this regard is excluded. Furthermore the IBU reserves the right to suspend or completely terminated the operation of the database and the domain at any time. 3. Using the database content free of charge is the rule. The IBU transfers to the user the simple, non-exclusive, non-sublicensable right to use the database content free of charge for his own use, which includes a readout of the data via html. Only registered users are entitled to download digital datasets by means of individual request from the database for the purpose of calculating life-cycle assessments. The content of the online data must not be changed or imitated. Nor may it be circulated to third parties or used commercially. If the user is seeking commercial use of the digitalised datasets or to circulate them to third parties, this must be arranged with the IBU in advance and agreed separately. is aimed at offering the database content of the IBU.data to third parties against payment or free of charge via own tools. The entitlement to use going beyond the commercial use of the data described under clause 3.1 is subject to payment. If the user has given incorrect, unspecific, outdated or incomplete details, the IBU has the right to block user account and to deny the user access to IBU.data in future. The same applies in the event that the user has violated applicable laws, in particular criminal or copyright laws or such that protect the rights of third parties, or if his conduct is damaging to the interests of the IBU or to a natural person or legal entity that is in a legal relationship to the IBU. The user has the right to access and correct and is entitled and able to delete his user account himself or to request from the IBU that this is done. For this he can write to the following email address: info@ibu-epd.com or to the following postal address: Institut Bauen und Umwelt e.V., Panoramastraße 1, 10178 Berlin. The materials and software required to access the page and use the IBU.data database are charged exclusively to the user. It is his responsibility to take all appropriate actions to protect his own data, EDP systems and/or software programs from infection by viruses. The use of the information, messages or data of any kind communicated by the service are the sole responsibility of the user. Also decisions or actions that the latter considers or carries out because of the information result in no further liability than that of the user. The user bears the sole responsibility towards the IBU and, if applicable, towards third parties, for the use he makes of the page and the service as well as for all direct and indirect damage of any kind caused by a piece of information or another content element. The IBU will take the usual care corresponding to the requirements of a database operator for updating and care of the database content, whereby the IBU is dependent on the supply of data by third parties. The IBU makes no representations that the content made available with the products and its selection is correct, up to date and complete. The user is himself responsible for the correct use of the database and a final check of the data and its evaluation. In spite of a regular data backup by the IBU, data dropouts or even data losses may occur. The IBU accepts no liability for this. The IBU is only liable under the statutory regulations for damage for injury to life, limb or health in the event of gross negligence by the IBU, a legal representative or vicarious agent or for damage falling under a warranty or assurance given by the IBU. In the case of slight negligence, the IBU is only liable for damage that is typical of this type of contract and foreseeable and only where a cardinal obligation has been breached. Apart from that, liability for slight negligence is excluded. The IBU is not liable for damage arising from malfunctions on lines, servers and other equipment that is not in the area of responsibility of the IBU. The IBU takes the protection of your personal data very seriously. The personal data of the user is stored by the IBU for processing as part of the use of the IBU.data database. All personal data transmitted by the user during registration at IBU.data is collected lawfully and in good faith. 7.2 Customer’s research requests and user profiles are treated in confidence by the provider. The legal relationship between the IBU and the user of the database as well as all claims and legal disputes arising from it are governed solely by the law of the Federal Republic of Germany.